This is the tank journal for my 125G tank. The tank is almost 12 year old, and as such has plenty of scratches. It recieved a mild midlife upgrade in the form of a wooden frame to hide the unsightly joints. However, the tank is made from solid 10mm glass and is tough as nails. Over the past few years though, it has been laying neglected as I was busy with work and no one else could handle the tank. It housed a few oscars and GTs for sometime but they didn't last very long. I know the walls are dirty right now, they'll be cleaned before plants are added. I am thinking of adding some taller driftwood as well. I am in two minds about the background. I know black is universally good for planted tanks, but I find myself leaning towards white as well, it doesn't have any background right now. What do you suggest? I am looking for good mid and foreground plant for the setup as well, any suggestions? Low lights and inert substrate limit options severely, however I do plan on adding root tabs, so maybe there might be a few plants which will do well. I am planning on adding DIY root tabs for the root plants, but I'm not gonna fertilize other ways. What do you guys think about the setup, comments and critique welcome. I am open to suggestions for any change in flora or fauna. The main requirement is that all the inhabitants must be hardy and peaceful, as for plants, they need to be able to flourish with the existing light setup and substrate. BIG! tank, the base is 2 feet wide that is a lot of floor for plants. why dont you start a dutch style tank, adding colour to your tank. buy good river sand about 3 inches substrate. start a carpet with marselia or monte carlo, then slowly add a variety of plants. you will need co2 and an external filter. see the youtube video of pedro rosa dutch style tank its awesome. I'd say a lot of amazon swords. We have some very good varieties commonly available these days. Substrate looks too bright with white all over, maybe you can replace most of it from back, for some darker river gravel(with a rich fertile base layer for crypts and sword). You can as well lower the lights if you do not intend to put pressurized co2 setup on this. see the youtube video of pedro rosa dutch style tank its &nbsp; awesome. The options are infinite, time and budget are not Therefore I am gonna stick to low tech for this tank. I dont wanna go for a very fertile substrate or too much dosing, or too much light because I wanna avoid algae as much as possible. The fish need to be the highlight of this tank, and plants would merely complement the fauna. Lots of swords it is! Can you suggest some good varieties? I was planning on keeping only the regular Echinodors amazonicus. Substrate is supposed to be bright, it has brown gravel underneath who's looks I didnt like a lot. I dont wanna have a very fertile substrate because I wanna avoid algae as much as possible. Instead I plan on adding root tabs in certain locations for the plants. However, now that I think about it, re-inserting root tabs after 2-3 months of growth is going to be a P.I.T.A., maybe I can have a few "islands" of fertile substrate in certain places where the plantation is going to happen. I am still a bit vary of adding a fertile substrate though. And do you think the light is too much? I had a feeling the tank is towards the low end in terms of lighting, about 12,000 Lumen for a 125G. As a rule of thumb(purely anecdotal) I consider anything under 120 lumen/gallon as a low light (this tank is 96lumen/gallon). Oh, you are going to have tapajos in this setup, dont know how I missed it. I have seen many people doing pretty decent low tech setups with tapajos/ eartheaters, but I have failed personally, maybe I had the crazy bunch. Eartheaters, I even had guinacaras once along with robust plants. They dig with passion man, its a huge PITA even without a layer of soil in islands. They even pulled out old matured large sized swords in the tank. I tried 2-3" black plastic pots as well topped with large bits of gravel tightly packed, they dint spare that either. Tired of all this I tied a piece of decent sized rock to the plant in substrate with a half rootball tucked right beneath the rock, that seemed to work...for sometime...till the breeding pair chose the spot to lay eggs right by the large sword. Annoyed by the waving leaves(I believe), they shredded the ones close to their eggs and piled up sand on the other side of rock completely burrying the sword rosette under 2-3in of sand, eventually killing it. After that I removed all the sand leaving about an inch evenly all over, added a few pieces of large wood with anubias tied on it. This along with a bunch of floating plants did the trick for me. I suggest you start out with plants first, let them settle in nicely, no soil, with just root tabs/capsules under the swords(you can use liquid fertilizers like seachem excel/glut for carbon on a frequent basis and tropica premium fertilizer once in a while to maintain plant health). 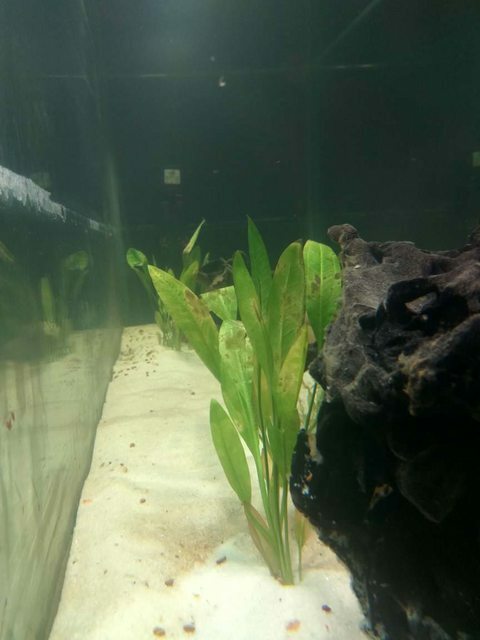 Let the plants grow in for a month or so and then add a bunch of small tapajos around 2". Tapajos in a well maintained tank grow pretty quick. I wish you luck for your setup. And for the swords you can try Echinodorus Major, E. argentinensis, E. Rubin, E. Bleheri, E.ozelot, E.Parviflorus(forms a nice 8-12" semicircular clump). For other robust low tech plants you can add red lilly, Aponogetton crispus, crypt wendtii, crypt pontederifolia. Dont add too many of the swords, one or two plants of each variety will suffice. 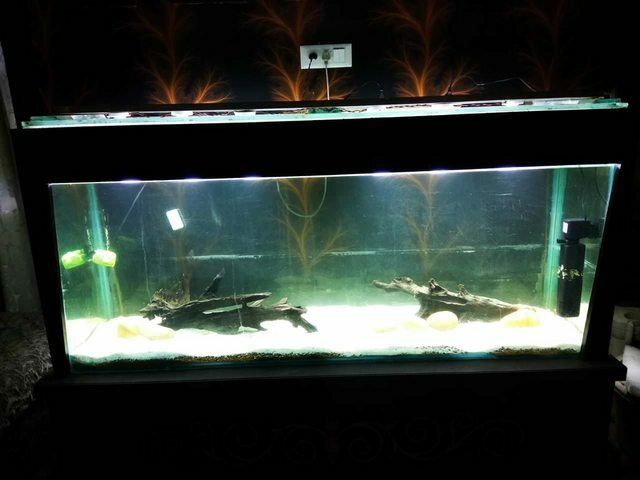 A total of 4-6 matured swords over a period of 12months can completely cover your tank. Thanx for your inputs regarding eartheaters! I knew they'd be a hit or miss, and as such Im not too keen on keeping them. 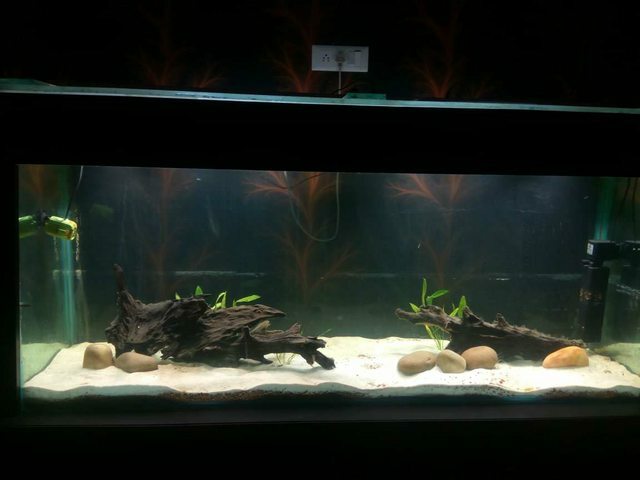 But I cant find any other interesting fish that would do well in this setup hence I was sticking to them, I dont wanna keep angels in it, and I wont be able to care for discuss I think . Im looking for a peaceful fish that grows to atleast 5 inch, and which wont make lunch out of the tetra schools. Can you suggest something? They are a good fish, however availability is a concern. Many others have suggested for the same too. Im thinkin medium to large schoosl of bosemanis, praecox, lemon tetras and rummy nose tetras will look great, a long with several loaches including a few clown loaches will look great for the setting. I am thinking of adding bacopa monieri and rotala rotundifolia as well. I have some java moss growing in my 7G nano, and I am planning on setting up a farm bucket for the moss to later use in this tank, because I will need LOADS of it should I decide to use it. Can you suggest me some low cost fertilizers? I can see plenty 20-20-20 NPK fertilizers on amazon, but I am looking for something that is similar to aquatic ratios, 14-14-14ish. 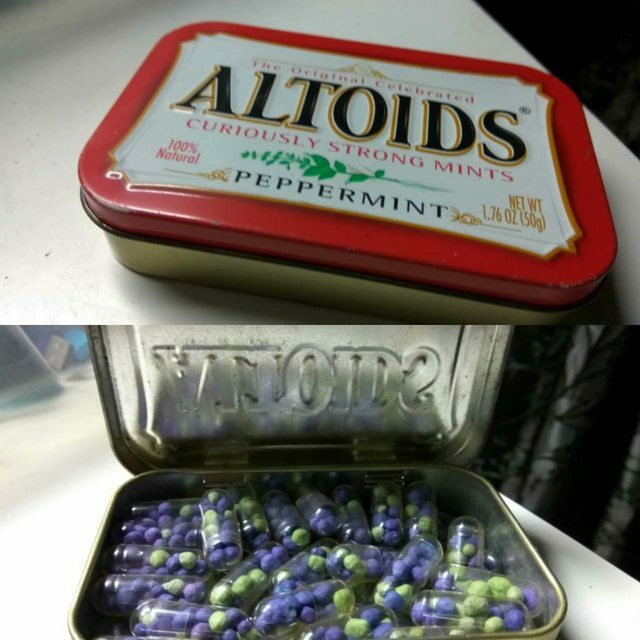 I am also looking for an osmocote substitute for my DIY root tabs, since the one I had decided earlier contains copper which can harm inverts. EDIT: I found an Osmocote clone that has a 14-7-14 ratio along with slow release resin. Going to order it and see how it goes. Added 5x Root tabs near the plants too. Query: Ive read in several places to not plant the "bulb" of the E. Amazonicus. However, the plants I got have very small roots, and there is no way they'll stay anchored if the base of the leaves are not under the sand. How should I plant them then? So diatoms have taken over the tank completely! Plants are growing, growth is slow, I expected more after 10 days of planting. Almost all Amazons are throwing new leaves and valisneria seems to have sprouted a few runners. However, DIATOMS!! The entire sand has turned an ugly brown! Manual removal is impossible due to the sheer volume. Im gonna try and reduce the photoperiod to see what happens but I've read diatoms are quite resilient. Maybe if I add a lot more plants they'll out compete the menace. Any tips? The water in my area is high in GH, however I've not run a test recently to point to any numbers. Evaporation always seems to leave scales. It recieved a mild midlife upgrade in the form of a wooden . Hi, Can you provide some insight how this wooden frame was done. My 5 feet also is having same ugly corners . Also i am unable to find any 5 feet compatable lighting as of now tubes are placed over the tank which is awfully bad and is an eyesore.